You will be ready to crawl out of your shell and relax in this beautiful property located in the lovely Ocean Crest Subdivision in the Town of Duck. Take advantage of the quiet ocean side community and enjoy this well-appointed and decorated property. Just steps from the beach, a good ocean view and ample decking to enjoy it from, and of course your own private pool make Sea Turtle the place to be for sun and fun! Top-Level: Great Room with gas fireplace, TV, Stereo with CD, Deck Access, Kitchen with Breakfast Bar seats 3, Dining seats 8, Half Bathroom, King Master with TV, whirlpool and shower. Mid-Level: Queen Master with TV and screened porch; Queen Master with TV; Queen bedroom with Deck Access; Bedroom with a Bunk Bed and a Twin; Hall Bathroom. Ground-Level: Den with Queen Sleep Sofa, TV, Hall Bathroom, Laundry. Carport, Entry. Extras: Private Pool (14x28), Wireless Internet Access, DVD players, Stereo w/ CD player, Gas Fireplace, Pac n play, High Chair, Gas Grill, Screened Porch, Basketball Goal, Fish Cleaning Table. No Smoking. Dogs Allowed, Parking: 6 Cars, Distance to the Beach: 562 ft. Private pools are open from May 3, 2019 until October 13, 2019. This property is not equipped for pool heat. Pool heat is not an option for this property. Gas fireplaces are shut down from May 17, 2019 until September 15, 2019. You will be ready to crawl out of your shell and relax in this beautiful property located in the lovely Ocean Crest Subdivision in the Town of Duck. Take advantage of the quiet ocean side community and enjoy this well-appointed and decorated property. 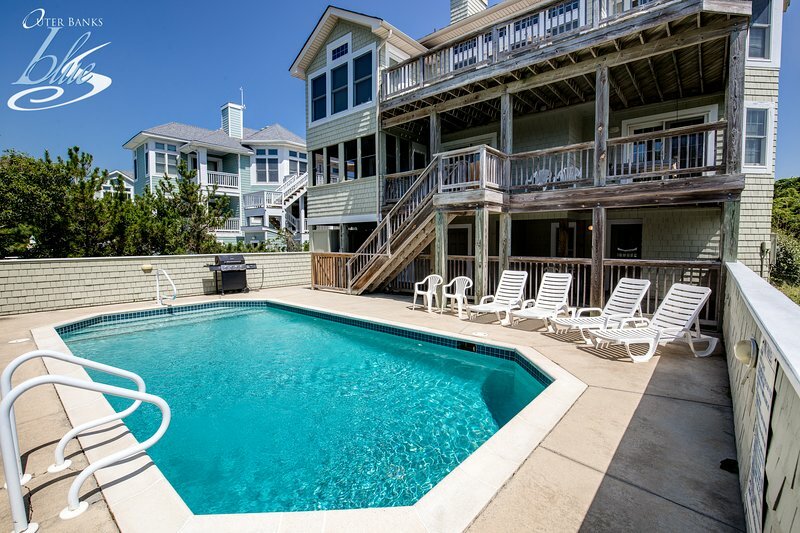 Just steps from the beach, a good ocean view and ample decking to enjoy it from, and of course your own private pool make Sea Turtle the place to be for sun and fun! Top-Level: Great Room with gas fireplace, TV, Stereo with CD, Deck Access, Kitchen with Breakfast Bar seats 3, Dining seats 8, Half Bathroom, King Master with TV, whirlpool and shower. Mid-Level: Queen Master with TV and screened porch; Queen Master with TV; Queen bedroom with Deck Access; Bedroom with a Bunk Bed and a Twin; Hall Bathroom. Ground-Level: Den with Queen Sleep Sofa, TV, Hall Bathroom, Laundry. Carport, Entry. Extras: Private Pool (14x28), Wireless Internet Access, DVD players, Stereo w/ CD player, Gas Fireplace, Pac n play, High Chair, Gas Grill, Screened Porch, Basketball Goal, Fish Cleaning Table. No Smoking. Dogs Allowed, Parking: 6 Cars, Distance to the Beach: 562 ft. Community Extras: Community Pool, Community Tennis Additional amenity details: Private pools are open from May 3, 2019 until October 13, 2019. This property is not equipped for pool heat. Pool heat is not an option for this property. Gas fireplaces are shut down from May 17, 2019 until September 15, 2019. All Outer Banks Blue properties provide bed linens, bath towels, beds made prior to your arrival, and a starter supply of: toilet paper, bathroom soap, paper towels, and dishwater detergent. Discounted H2OBX Water Park tickets available when you book with Outer Banks Blue.